Explore below key excerpts of revealing news articles on the escalating protests by Google employees of the company's development of advanced war technology for the US military, increasingly intrusive 'bio-tracking' systems including microchip implants paired with GPS location devices that allow employers to track every move, how Big Pharma price gouging on a single prescription drug created a public budget crisis in a US city, and more. Read also wonderfully inspiring articles on Costa Rica's plan to ban fossil fuels nationwide, California's requirement that all new homes have solar panels installed, a private high speed rail project in Florida designed to take as many as 3 million cars off the road, and more. You can also skip to this section now. Special note (sources may be less reliable): Read this article to learn about an alternative way to develop better vision. Read about an important study by a respected scientist which was ignored by the media, yet found a clear link between the hepatitis B vaccine and autism. Google/Alphabet has dropped "don't be evil" from their code of conduct. Watch an inspiring three-minute video on war veterans who are overcoming PTSD with country dancing. 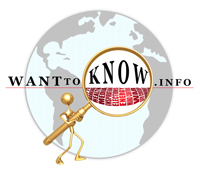 Good News: Thanks to the appearance of WantToKnow.info founder Fred Burks on Coast to Coast AM one week ago, we have over 400 new subscribers. Welcome to all of you! Hundreds of academics have urged Google to abandon its work on a U.S. Department of Defense-led drone program codenamed “Project Maven”. An open letter calling for change was published Monday by the International Committee for Robot Arms Control (ICRAC). The project is formally known as the Algorithmic Warfare Cross-Functional Team. Its objective is “to turn the enormous volume of data available to DoD into actionable intelligence”. More than 3,000 Google staffers signed a petition in April in protest at the company's focus on warfare. “We believe that Google should not be in the business of war,” it read. “Therefore we ask that Project Maven be cancelled.” The ICRAC warned this week the project could potentially be mixed with general user data and exploited to aid “targeted killing.” Currently, its letter has nearly 500 signatures. It stated: “We are ... deeply concerned about the possible integration of Google’s data on people’s everyday lives with military surveillance data, and its combined application to targeted killing ... Google has moved into military work without subjecting itself to public debate or deliberation. While Google regularly decides the future of technology without democratic public engagement, its entry into military technologies casts the problems of private control of information infrastructure into high relief.” Lieutenant Colonel Garry Floyd, deputy chief of the Algorithmic Warfare Cross Functional Team, said ... earlier this month that Maven was already active in “five or six” combat locations. Note: You can read the full employee petition on this webpage. The New York Times also published a good article on this. For more along these lines, see concise summaries of deeply revealing news articles on corporate corruption and war. There’s something eating at Google employees. Roughly one dozen employees of the search giant have resigned in the wake of reports that the ... company is providing artificial intelligence to the Pentagon. The employees resigned because of ethical concerns over the company’s work with the Defense Department that includes helping the military speed up analysis of drone footage by automatically classifying images of objects and people, Gizmodo reported. Many of the employees who quit have written accounts of their decisions to leave the company. Their stories have been gathered and shared in an internal document. Google is helping the DoD’s Project Maven “implement machine learning to classify images gathered by drones,” according to the report. “Some employees believe humans, not algorithms, should be responsible for this sensitive and potentially lethal work - and that Google shouldn’t be involved in military work at all.” The 12 resignations are the first known mass resignations at Google in protest against one of the company’s business decisions - and they speak to the strongly felt ethical concerns of the employees who are departing. In addition to the resignations, nearly 4,000 Google employees have voiced their opposition to Project Maven in an internal petition that asks Google to immediately cancel the contract and institute a policy against taking on future military work. For decades, Don Anderson of Seattle has been taking the same drug to help control the temporary bouts of immobility and muscle weakness caused by a rare and frightening genetic illness called periodic paralysis. The drug Anderson has been taking all these years was originally approved in 1958 and used primarily to treat the eye disease glaucoma under the brand name Daranide. The price has been on a roller coaster in recent years — zooming from a list price of $50 for a bottle of 100 pills in the early 2000s up to $13,650 in 2015, then plummeting back down to free, before skyrocketing back up to $15,001 after a new company, Strongbridge Biopharma, acquired the drug and relaunched it this spring. The zigzagging trajectory of the price of Daranide, now known as Keveyis, shows just how much freedom drug companies have in pricing therapies — and what a big business opportunity selling extremely-rare-disease drugs has become. In 2016, after The Washington Post asked questions about the high price of the drug, Sun Pharmaceutical said it would give the drug away free. Late last year, Sun agreed to sell Keveyis to a biotech company, Strongbridge Biopharma. In April, Strongbridge relaunched the drug. In August, it jacked the list price ... to $15,001 for a bottle of 100 pills. In a PowerPoint presentation for investors, Strongbridge Biopharma estimated that the annual price of treatment for the drug, Keveyis, would range from $109,500 to $219,000. One very expensive prescription drug threatened to financially cripple an entire city. Rather than using a health insurance company, Rockford, [Illinois] has, for years, paid its own health care costs for its 1,000 employees and their dependents. When Rockford got hit with the drug bill it was so enormous the mayor at the time set out to understand why. In 2015, two small children of Rockford employees were treated with Acthar, a drug that's been on the market since 1952. In 2001, Acthar sold for about $40 a vial. Today: more than $40,000. [Rockford Mayor Larry Morrissey] wanted to know how that could've happened. His investigation got nowhere until last year, when the Federal Trade Commission charged the drug manufacturer, Mallinckrodt, with violating antitrust laws. [The company] bought another drug that was Acthar's main competitor ... and put it on the shelf. Many of the doctors who prescribed a lot of Acthar also were getting money from the company that makes Acthar ... adding up to huge sums. Cities like Rockford [hire pharmacy benefit managers or PBMs] to negotiate down the price of drugs. The company negotiating prices for Rockford is Express Scripts. Express Scripts is many companies, not just the PBM. It also owns a pharmacy that sells expensive drugs, [as well as] a company that ships and packs expensive drugs. The city of Rockford was able to find out one more piece of the puzzle: that Express Scripts ... had a contract to be the exclusive distributor of Acthar. Pharmaceutical companies that spend billions of dollars to develop new drugs do not want competitors to profit from inexpensive generic copies of blockbuster medicines. To avoid rivals, they ... sometimes prevent generic drug companies from obtaining samples. Dr. Scott Gottlieb, the commissioner of the Food and Drug Administration, calls this “gaming the system,” and has vowed to stop it. On Thursday, the F.D.A. took a new tack and began posting a list of makers of brand-name drugs that have been the target of complaints, to persuade them to “end the shenanigans,” in the commissioner’s words. Congressional efforts to force the companies to hand over samples of their drugs to generic competitors have not been successful. Generic drug developers usually need between 1,500 to 5,000 units of the brand drug to develop their product and test it. Both the F.D.A. and the Federal Trade Commission say securing the samples can be difficult. The F.D.A.’s new list includes drug companies the agency said may be pursuing gaming tactics to delay generic competition. Along with the name of each business, the agency noted how many inquiries it received from generic drug companies seeking supplies. Celgene, [which makes drugs to treat cancer and immune-inflammatory diseases], tops the list. Other companies ... included GlaxoSmithKline, Pfizer, Valeant Pharmaceuticals International, BioMarin Pharmaceutical, Gilead Sciences and Novartis Pharmaceuticals. Tom Patterson lay in a coma. Three months earlier ... Patterson had suddenly fallen ill, so severely that he had to be medevaced to [University of California-San Diego’s medical center]. The core of the problem was an infection with a superbug, a bacterium named Acinetobacter baumannii that was resistant to every antibiotic his medical team tried to treat it with. He was dying. “We are running out of options to save Tom,” [Tom's wife Steffanie Strathdee wrote to the hospital’s head of infectious diseases, Dr. Robert Schooley]. “What do you think about phage therapy?” Phages are viruses [that] kill only specific strains of bacteria. They can quell infections without inducing a terrible diarrheal disease ... that occurs when the balance of bacteria in the gut is disrupted by antibiotics wiping out good bugs along with the bad. But for phage therapy to be deployed routinely in the United States, phages would have to be approved as drugs by the FDA. To treat an American patient with them now requires emergency compassionate-use authorization - effectively an acknowledgment that nothing with an FDA license can save the patient’s life. The FDA agreed to let the pair attempt phages. The whole treatment process was a scramble. Patterson, however, made it. He left the hospital ... having beaten the superbug using phages. He was the first person in the United States to have been successfully treated intravenously. Strathdee ... says she hopes to see phages become a routine option for serious infections, available to substitute for antibiotics. Note: The unwarranted use of prescription antibiotics by doctors and the routine practice of adding antibiotics to animal feed in factory farms have led to what the Los Angeles Times recently called "a slow catastrophe" of antibiotic-resistant infections. For more along these lines, see concise summaries of deeply revealing health news articles from reliable major media sources. Michael Cohen, President Trump’s personal attorney, solicited a payment of at least $1 million from the government of Qatar in late 2016, in exchange for access to and advice about the then-incoming administration. The offer, which Qatar declined, came on the margins of a Dec. 12 meeting that year at Trump Tower between the Persian Gulf state’s foreign minister and Michael Flynn, who became Trump’s first national security adviser. Cohen did not participate in the official meetings but spoke separately to a member of the Qatari delegation, Ahmed al-­Rumaihi, who at the time was head of the investments division of the country’s sovereign wealth fund, the Qatar Investment Authority. The solicitation came during a period when Cohen was bragging to others that he could make millions from consulting on Trump and that foreign governments would be interested in having his expertise. As Cohen collected clients, he texted associates articles that described him as Trump’s “fixer” and asked them to spread the articles around. Special counsel Robert S. Mueller III and the U.S. attorney for the Southern District of New York, which conducted raids last month on Cohen’s New York residence and office, are investigating his activities. To microdose is to take small amounts of LSD, which generate “subperceptual” effects that can improve mood, productivity and creativity. Michael Pollan’s new book, “How to Change Your Mind,” is not about that. It’s about taking enough LSD or psilocybin (mushrooms) to feel the colors and smell the sounds. If Pollan’s wide-ranging account has a central thesis, it’s that we’re still doing the hard work of rescuing the science of psychedelics from the “countercultural baggage” of the 1960s. In the mid-60s “the exuberance surrounding these new drugs gave way to moral panic,” and ... “the whole project of psychedelic science had collapsed.” Before collapsing, though, that project discovered in psychedelics the same potential that scientists are exploring as they reclaim it today: possible help in treating addiction, anxiety and depression, and “existential distress” — common in people “confronting a terminal diagnosis,” which of course, broadly speaking, is all of us. Pollan doesn’t give a lot of prime real estate to psychedelics’ naysayers. But given that those on LSD can appear to be losing their minds, and that the drug leaves one feeling emotionally undefended (a potential benefit as well as a profound risk), he does strongly recommend having an experienced guide in a proper setting when you trip. With those safeguards in place, he believes usage could be on the verge of more widespread acceptance. Note: A recent clinical trial found psilocybin to be an extremely effective treatment for anxiety and depression. Articles like this suggest that the healing potentials of mind-altering drugs are gaining mainstream credibility.